Beyond fun, exercise and education many of our Bankeside members also conduct sword demonstrations at various events in Southern California. The Bankeside Schoole of Defense conducts training every Saturday 9 months out of the year. The rest of the year we're focusing on demonstrations at various events. 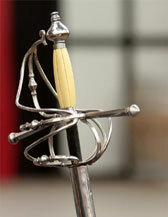 The Bankeside Schoole of Defense is a historical stage combat school, located in Southern California, that is dedicated to the study of European swordsmanship with an emphasis on Italian 16th century rapier and sidesword fighting. 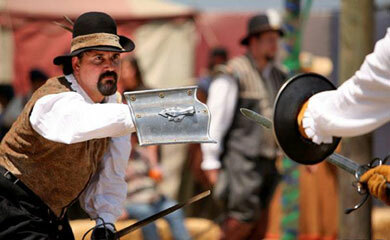 Members of Bankeside are involved with the Renaissance Pleasure Faire in Southern California each spring, and bring to life a different aspect of renaissance living by staging daily fights and bouts on the streets of the faire. 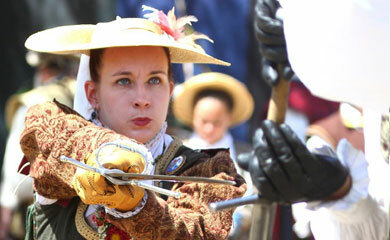 We train in regular classes using replica weapons and techniques learned from existing 16th century manuals to further our knowledge and expertise in this almost forgotten art. The Bankeside Schoole of Defense conducts training every Saturday 9 months out of the year in Yucaipa California. The rest of the year we're focusing on demonstrations at various events.